Welcome to My Kitchen Serenity! I’m glad you’re here! 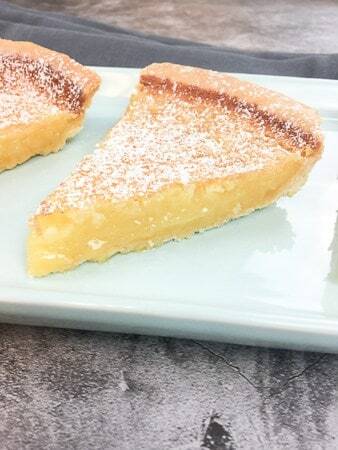 Let’s talk about this Lemon Chess Pie recipe! Are you a lemon lover? I absolutely love everything lemon. Lemon pie, lemon cake, lemon chicken, etc. So if you’re here because you’re wondering how to make a lemon chess pie, then you’ve come to the right place. And it’s a super easy dessert! Not just for a summer or holiday dessert either, this pie is a wonderful dessert any time of the year. BUT if you’re also a chocolate lover, or know someone who is, then check out my chocolate chess pie recipe. It’s just as delicious only in a rich chocolate flavor! Like I said earlier, this pie is super easy. Buy a ready-made pie crust and bake according to package directions. Alternatively, you could press the thawed, ready-made pie crust into a tart pan for that fancy crinkled pie look; then bake as directed. In a large bowl, mix together the ingredients: sugar, eggs, lemon zest, lemon juice, butter, a little flour, and a little cornmeal. The cornmeal assures the crispy topping so don’t leave it out! Pour into prepared pie crust, bake at 375 for 35 minutes. Voila! It’s OK if the filling doesn’t appear to be fully set when you remove it from the oven. As the pie cools, it will thicken. Once cooled, sprinkle with powdered sugar. Or top with whipped cream. I think it’s at its best flavor and texture when fully chilled but some people eat it while it’s still warm. Either way, it’s oh so delicious. 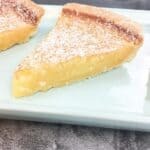 Lemon Chess Pie is an easy, tart ooey gooey pie that bakes up with a sweet crispy candy-like top crust. 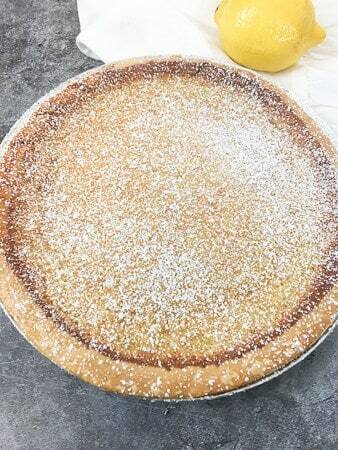 Chess pie is an old fashioned southern favorite that everybody loves. Bake ready made pie crust according to package directions. Heat oven to 375. Combine sugar, cornmeal, flour, and eggs in large bowl using a whisk. Stir in melted butter, lemon juice, and lemon zest. Mix well. Pour into prepared pie crust and bake for 35 minutes or until filling is mostly set but no more than 40 minutes. Cool on a wire rack. Transfer to refrigerator to chill. Sprinkle with powdered sugar or top with whipped cream. NOTE: Can be served at room temperature but I think it's better served cold. If you try this recipe and like it, please leave me a comment. I’d love to hear from you! I love all the lemons! This recipe looks delicious and perfect for a summer get together. Thanks for posting…adding it to my recipe file now. Hey Shirley! 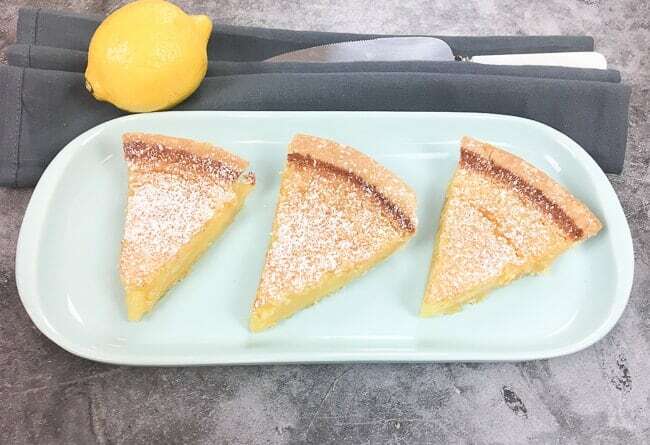 I love lemons and this pie is wonderfully sweet and lemony! Thanks for your comment! Hope you enjoy it! I am a lemon lover! This recipe looks so easy, I’m surprised I never tried it. Looking forward to making this. Thanks for sharing. Such a lovely recipe and I will be sure to try this one. Like you, I like all things lemon. Just today I made a lemon mascarpone cake. Thanks Joleisa! Lemon mascarpone cake is one my favorites!